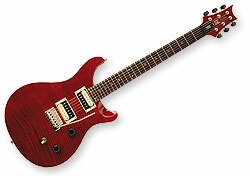 SE Custom 24 - Black Cherry, Other Shape Guitar from PRS belonging to the SE Custom 24 model. Paul Reed Smith acquired exclusive rights to the original pickup wire from the original machine used to make the '50s era pickups in 2008, and 1957 was the year the humbucker was first commercially available, giving way to the the 1957/2008 pickup. The new PRS Sunburst Series™, the McCarty II, the Al Di Meola Prism and a limited run of solid body electrics introduced at Experience PRS 2008 are presently the only models that come standard with 1957/2008 pickups. Three models are offered as part of a 1957/2008 Limited Run: the Custom 24, the McCarty and the SC 245. Limited to 750 guitars, the limited run and the new Sunburst Series™ are the only place outside of Private Stock where new "old style" McCarty PRS models are currently available, according to PRS. For more information, visit their web site at www.prsguitars.com. [NAMM] Vox AC4TV Guitar Amp VOX Amplification introduces the AC4TV, a 4-Watt Tube Amplifier based on the VOX AC4 from the 1960s. [NAMM] New PRS Acoustic Guitars PRS Guitars officially announced the first in a series of acoustic guitars: The Angelus Cutaway and the Tonare Grand models. [NAMM] PRS SE Custom 24 PRS adds to its SE series with the introduction of the SE Custom 24 electric guitar.